Every winter, southeast Michigan gets more than its fair share of cold weather. Averaging more than 30 inches of snowfall each year, our region sometimes experiences below-freezing temperatures for weeks at a time. Detroit is no place to live without good central heating. Thankfully, you don’t have to with Andy’s heating and cooling in Michigan. With Andy’s Statewide nearby, you can rest assure that all of your in-home heating and furnace needs will be looked after. Our expert professionals know how to provide you with reliable, state-of-the-art, energy efficient heating in Detroit, Ann Arbor, Troy, MI and the surrounding communities. No matter the amount of snowfall outdoors, you can stay nice and cozy in the comfort of your home. That’s because we are southeast Michigan’s trusted source for installing, repairing, and maintaining your in-home heating system. 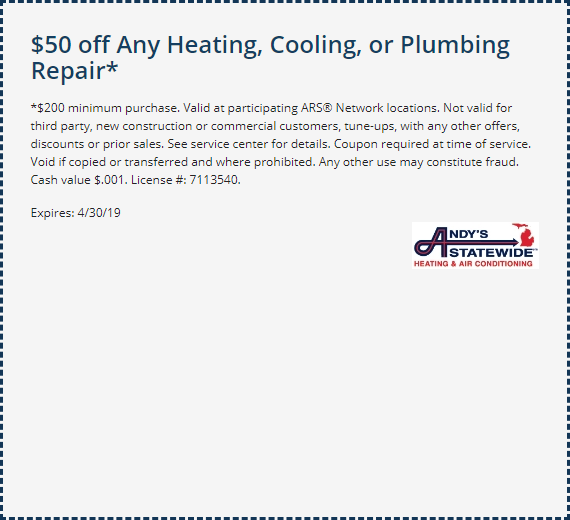 Whether it’s an emergency repair, a tune-up, a new installation, or a heating replacement in Detroit you need, Andy’s Statewide has both the skill and experience to get the job done. Even better, we can do it in a way that satisfies your budget and your schedule. So don’t let another winter’s day find you shivering indoors. Call Andy’s Statewide and let us get your warm air flowing.